Navarrette: Gates, Crowley made progress; will the U.S. do the same? 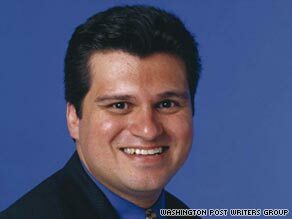 Editor's note: Ruben Navarrette Jr., a nationally syndicated columnist and a regular contributor to CNN.com, is the author of "A Darker Shade of Crimson: Odyssey of a Harvard Chicano." Read his column here. Ruben Navarrette Jr. says Crowley and Gates made progress in their beer session at the White House. SAN DIEGO, California (CNN) -- For the last two weeks, Americans have been divided into two feuding camps: "Team Gates" and "Team Crowley." But after Thursday, those terms seem antiquated. As everyone knows, on July 16, Harvard Professor Henry Louis Gates Jr. was arrested by Sgt. James Crowley of the Cambridge Police Department. Gates was charged with "loud and tumultuous behavior in a public place." Thursday night, Crowley and Gates shared a beer with President Obama, who had earlier acted clumsily when he said the Cambridge Police had "acted stupidly." Once it became clear that Crowley didn't fit the caricature of a racist cop -- even teaching police academy cadets how to avoid racial profiling -- Obama backed off those remarks and invited the parties to the White House for some brews. Peanuts and pretzels were served in silver bowls, but humble pie would also have been appropriate -- for Obama and for Gates. Ironically, both of these learned men have talked about how this incident should be a teaching moment. Judging by what Gates wrote after the meeting on theroot.com, maybe he did learn something. "I thank God that I live in a country in which police officers put their lives at risk to protect us every day," he wrote, "and more than ever, I've come to understand and appreciate their daily sacrifices on our behalf." The question now is whether America learned the correct lessons from all this. With all this talk about teaching, I sure hope that Crowley wasn't cast as the student in the White House gathering. In fact, despite what former Secretary of State Colin Powell said this week on CNN's "Larry King Live" about how the police needed "adult supervision," it sounds like -- from the police report and from neighbors -- Crowley was the grownup in this altercation. He was just doing his job while Gates was haranguing him, calling him a racist, and dragging his "mama" into the fray. Commentary: Gates arrested for "housing while black"
There is a right way to address a police officer and a wrong way. You can either defuse a situation before it gets out of control or wind up handcuffed in the back of a police cruiser. Americans are always ready to assert their rights -- including, in this case, what some insist is the right to tell off a police officer and get away with it. They'd be better off remembering that rights always come with a side order of responsibilities -- including the responsibility to treat those in positions of authority with the proper respect, as we should all people. You'd think a PhD would have enough common sense to know that. And that lesson is colorblind. If the officer were black, and the person scolding him were white, do you suppose that Gates would be on the side of the officer or the person doing the scolding? I suspect he'd back the officer and frame the issue as one of failing to give an authority figure the proper respect. When I first heard the story, I was inclined to join Team Gates. This was packaged as being about racial profiling. I abhor the practice. Not only is it wrong, since people have a right to be left alone when they've done nothing wrong, but it's also bad policing to eliminate whole groups of people from suspicion to focus based on little more than prejudice. If you doubt it, note how well things turned out, several years ago, when investigators trying to solve the serial killings by the Washington-area snipers focused initially on white males, because serial killers usually fit that profile. In the end, the two men arrested for the killing spree were African-American. But then we heard Crowley and Gates give their version of events in competing interviews, and -- at least to me -- the cop's tale of what happened just sounded more plausible. I was impressed by the fact that Crowley very calmly and professionally refused to apologize, insisting that he hadn't done anything wrong. We also heard from black police officers who work with Crowley, including a black sergeant who was at the scene. Not only did they defend their comrade, but they also made clear that it was Gates who was trying to create -- in the words of Cambridge police officer Kelly King, a black female -- a "smokescreen" that the imbroglio was about race when it wasn't. Right. If anything, this was about class. According to the police report, Gates told Crowley: "You don't know who you're messing with" and then apparently tried to go over the sergeant's head by calling the chief of police during the confrontation. After his arrest, black academics came to his defense and insisted that, if this could happen to "Skip" Gates, it could happen to anyone. Catch that? The black elites who depicted Gates as Huey Newton in a tweed coat long ago stopped seeing themselves as part of the community they claim to represent to the rest of academia. Police might roust other African-Americans. But Skip and his posse spend their summers on Martha's Vineyard. They're better than ordinary black folks, and they expect to be treated as such. Those were just some of the societal fissures exposed by this incident, and many of them were most unpleasant. We learned more than we cared to know -- not about Crowley or Gates, but about ourselves. Yet now, thanks to a little South Lawn diplomacy, some good might come from the bad. There were hopeful signs. Crowley said Thursday's beer gathering was a "cordial and productive discussion." The sergeant talked about how he and Gates were more interested in moving forward than looking backward. After the meeting, Gates wrote, "We've learned that we can have our differences without demonizing one another. There's reason to hope that many people have emerged with greater sympathy for the daily perils of policing, on the one hand, and for the genuine fears about racial profiling, on the other hand." Well said, gentlemen. We could use more cordial discussions, and more sympathy for each other's positions. Believe it or not, you might just be on the same team after all.